All the honey a bee gathers during its lifetime doesn't sweeten its sting. About 6,000 bees made Estle Schipp Farm their new home yesterday! The two packages we ordered were available for pick up and we got them introduced to their new home but not without incident. Yep, both Bob and I received a few little defensive blows from our new residents. I am amazed with how comfortable I have become with the bees. As a child, I was always quite afraid of them but have grown much more at ease. No longer do I panic when several land on my clothing when tending the hives...except when they get too close to my mouth and nose or get tangled in my hair.....Lesson Number 3: Never panic near the hives - this means slow movements and no swatting! That swatting and panic spreads like wildfire through the hive and you will have a multitude of buzzing warriors chasing you through the yard. Yes, you would have seen Bob and I racing as fast as possible from that bee yard yesterday...LOL...at least it is LOL today, not so much yesterday. Bees will chase you much farther than you think they will. So, we are wearing our beekeeper badges of honor in the way of a few bee stings a piece. What are some good ways to tend to the wounds? According to WebMD, here are the basics. If the person who received the bee sting has trouble breathing, feels faint or dizzy, has hives or a swollen tongue, has nausea or a rapid heartrate: CALL 911 - this is a true emergency! If there is not a history of allergy to stings, first remove the stinger by scraping it out of the skin. Do not squeeze since that can put more venom in the wound. Treat swelling with ice and elevation. If the sting is on your hand, be sure to take off your rings before swelling begins. For pain, use an appropriate over the counter pain reliever like acetaminophen or ibuprofen if you can take them. For itching, an antihistamine can help. 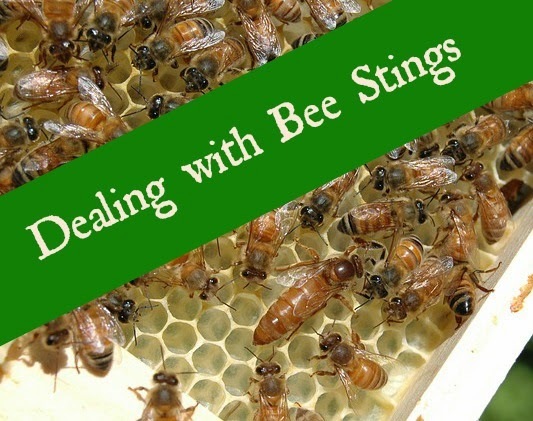 A paste of baking soda and water to the sting can help too. Keep the area clean call your physician if you see any signs of infection. That old Italian proverb might say that the sweetness of the honey doesn't make up for the sting, but with proper care and attention, the sting can be avoided and the honey a wonderful gift from these hard-working, beautiful creatures. I hope beekeeping finds its way to your hobby farm sometime soon! 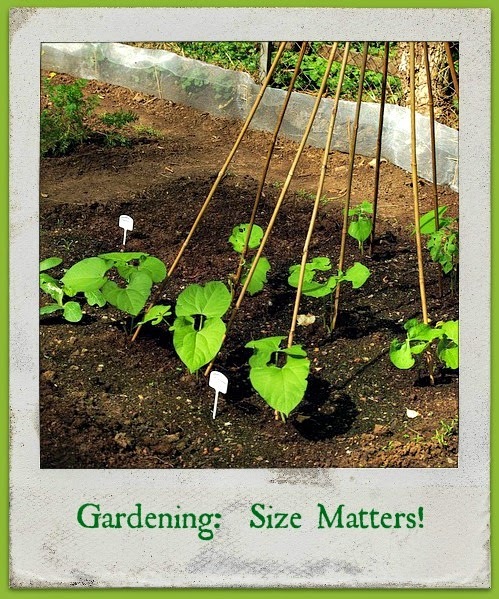 Saturday Skill: Planning the Garden: Size Matters! Real gardeners know their gardens change size in the course of a year. When they order seeds and plants in the winter, their gardens are the size of a football field. At planting time in the spring, their gardens are the size of a postage stamp. When it's 100 degrees outside in August, their gardens are the size of three football fields. And in the fall, when it's time to clean up, their gardens don't exist at all! Happy Spring! Gardening has started in earnest at Estle Schipp Farm. Rhubarb is sprouting and asparagus too. The strawberry leaves are greening up and some garden beds have been planted with onions, potatoes, radishes, peas, lettuce, broccoli, cauliflower, swiss chard, spinach, kale and carrots. I look out at the raised beds that Bob created for me last season and see a wonderful garden bounty in our future! I'm pouring over the Seed Savers Exchange Yearbook and plan this year's garden as I do every year. I am so very guilty of planning a garden than is larger than I can reasonably care for in the limited time I have for it. This year, I promised myself to use restraint. That restraint can be hard to come by! One of the worst mistakes I have made in gardening is making it so big that I cannot stay on top of weeding and being frustrated with the garden yield because of it. One year, I tearfully told Bob to just mow it down because the weeds overwhelmed. Now is the time to right size the garden for the amount of time you can spend per week to plant, water, weed, harvest and process the gifts your garden will produce. Anna Hess, author of The Weekend Homesteader, suggests that a garden of 144 square feet will require a couple of hours of work per week. That would be a prepared soil bed of 3 feet by 48 feet and would be a great start for the beginning gardener provided the correct plants are chosen. Green Beans: I love being able to pick these fresh and have on the dinner table in hardly any time at all. Quite easy to grow too! Mint: After some time in the sun weeding the garden, pluck some fresh mint to add to your ice water and you will feel cool and refreshed right away. Gardening is a year round event. Planning in the Winter, planting in the Spring, tending in the Summer and harvesting/clean up in the Fall. 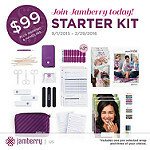 It is so easy to overcommit and not see the project through. This year, let's downsize that garden and take pride and joy in work well done. Happy growing!